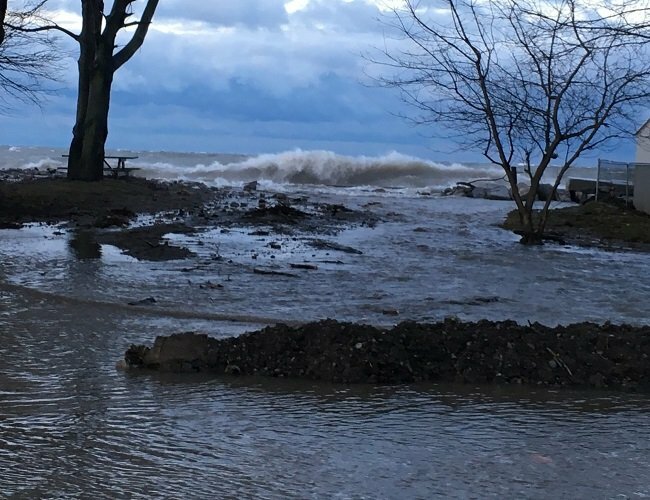 Watershed Conditions – Safety Bulletin – Lake Erie Shoreline – January 18, 2019 – 1:00 p.m. Environment Canada has issued a Special Weather Statement due to a large winter storm expected to enter the area later tonight and to last into tomorrow night. They have also issued a Gale Warning for western Lake Erie. Strong winds over 35 km/hr from the northeast are expected from Saturday morning until the late evening or overnight period when they should shift to a more northerly direction. Winds could reach sustained speeds of 45 km/hr with gusts of 65 km/hr tomorrow afternoon. Over the open lake, sustained winds could reach 65 km/hr. By tomorrow afternoon, waves on Lake Erie could reach 2 to 3m in height. Since tomorrow’s winds are expected to be out of the northeast, they will mostly be pushing waves along the shoreline rather than attacking it directly. However, there is a greater risk for shoreline areas oriented more north/south, such as the eastern side of Rondeau, including the Rose Beach Line area, as well as the Detroit Line area in Wheatley. There is a risk of erosion, damage to shoreline protection, and flooding due to waves crashing against shoreline protection and spraying up onto the land. Temperatures are predicted to be below freezing during this entire period which creates the risk that any wave spray or floodwaters could freeze creating hazardous conditions. Given the uncertainty around wind and wave forecasts, residents along the Lake Erie shoreline should pay close attention to both weather forecasts and current conditions and prepare accordingly. People should take extra caution and avoid the shoreline should conditions get rough. The waves can be strong and the shoreline slippery, especially freezing conditions. There could also be hazardous debris within the waves and water which could be thrown onto the shoreline. Standing water can also present unseen hazards. Children and pets should be kept away from the water. Officials will continue to monitor the situation and update this advisory if necessary. Contact: Jason Homewood (jason.homewood@ltvca.ca) or Jason Wintermute (jason.wintermute@ltvca.ca) regarding this message. This message will be in effect until January 21, 2019.